Cate Masters: It's hunting season! No, no, not that kind of hunting. 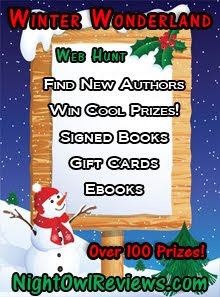 Night Owl Reviews still has two web hunts, in which you can win great prizes from great authors! 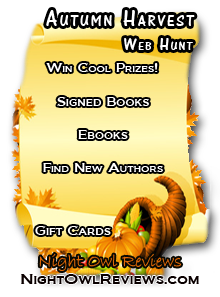 Throughout November, it's the Autumn Harvest Web Hunt, and in December, walk through the Winter Wonderland Web Hunt. Surfacing is a delightful, entertaining, and touching read that will have readers rooting for the young hero and hoping that somehow fairytales can come true. This is more than a romance: it is a coming-of-age story that will linger in my memory. I truly enjoyed every page, and I think that if you decide to read it, you may as well. Another riveting, well researched yarn from the pen of master story-teller Cate Masters. The Lakota Indians lives are upturned by the white man encroaching into their territory. In a desperate act to ensure the tribe's survival, the chiefs agree to the proposal of an army captain that their children be sent to a boarding school in far off Pennsylvania, to be taught the white man's way. It is an experiment that brings tragic results. Quiet Thunder an Indian brave and sweet natured but determined Black Bear love each other. But can their love survive them being uprooted from their people, betrayed and lied to by the white man? Will they ever find their way back to their own people? You will have to read this story to find out. But it is a fabulous journey, and you will enjoy it every step of the way.